The World Champions unveiled their latest creation at Gainesville, a Mustang II Pro Stocker that captured runner-up and set Low E.T. of the Meet on its first outing!!! The latest thing out of the famous Livonia, Michigan shop is the beautiful Mustang II that has already to turn some of the quickest and fastest times this year. WHEN FORD INTRODUCED the Mustang II, almost immediately, there was talk of the possibility of a Pro Stock version of the new compact. However, the optimism was dimmed a bit, as many felt that the care could not be as competitive as the Pinto because of the Pinto’s allegedly superior aerodynamics, and a structure which was inherently better for drag racing. 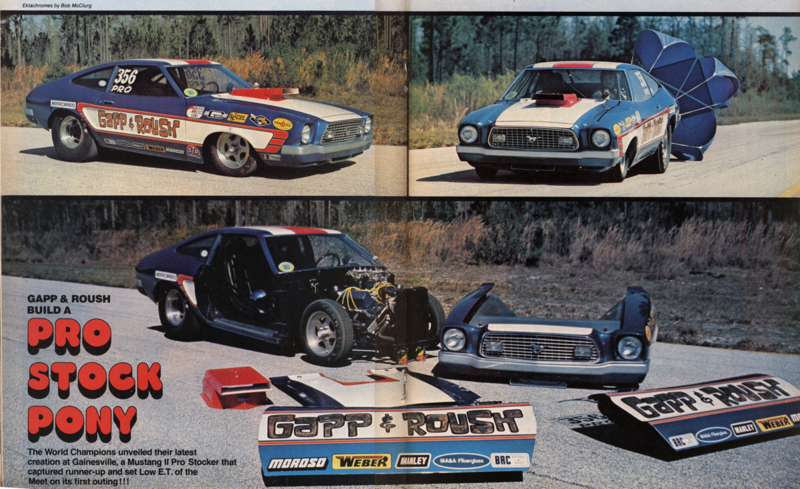 Nonetheless, Wayne Gapp and Jack Roush, who field one of the two most successful of all the Pinto’s, got right to work constructing a Pro Stock pony car. Any doubts that the car could be competitive were quickly dismissed when the are laid down a sizzling 9.03 at 152.88 mph on its maiden pass at the recent Gatornationals, good enough for the number two qualifying spot. During Sunday morning’s timetrials, the car managed to set Low E.T. of the Meet at 8.88. Then, during eliminations, the car managed to set Top Speed of the Meet at 153.06 mph with elapsed times of 8.94, 8.97, and 8.95 before losing in the final to Wally Booth’s Hornet with a nonetheless very fine 9.01 at 152.02 mph. To top all of this off, on the following weekend at Cecil County Raceway in Maryland, Roush cut an incredible 8.84 at 154.90 mph. Since this was for a circuit race, the run was made at NHRA legal weight of 2420 pounds. Even the most die-hard Chevy or Mopar fan should have his curiosity aroused by now, so without any further ado, we’ll get right into the details of the new Gapp & Roush contender. The new Mustang racer was assembled from individual body parts rather than from an entire car. This eliminated may hours of scraping off sealers and insulation, and also provided better control over the acid-dipping process. All panels have been treated except for the roof, quarter panels and the driver’s door. A&A Fiberglass supplied an entire one piece front end for the car, which has been glassed onto a magnesium tube frame. This entire front section, together with the radiator and aluminum inner fender panels, can be removed in a matter of minutes for easy access to the engine. Also provided by A&A are a fiberglass dashboard and hatchback, again, to keep the weight down. The car was assembled from individual body panels rather than a complete car in order to maintain better control over the lightening process. The chassis for the 96″ wheelbase care is a Don Hardy creation featuring widely-spaced double-tube frame rails under the floor pan. It is constructed from a combination of both square and round tubing, and is extremely rigid. 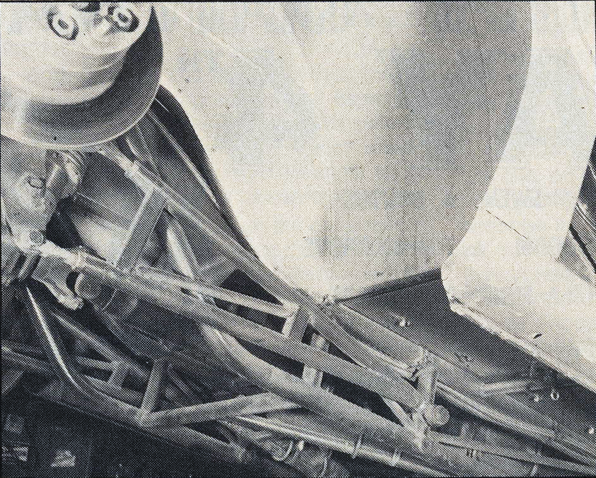 The main roll bar loop is cross-braced with an “X” type support construction within, and is also tied into the frame rails both fore and aft by individual struts. The firewall is also tied into the roll cage for additional strength. Double tube subframe ties into the roll bar cage to form a very rigid structure. Ladder bars attach to the subframe. 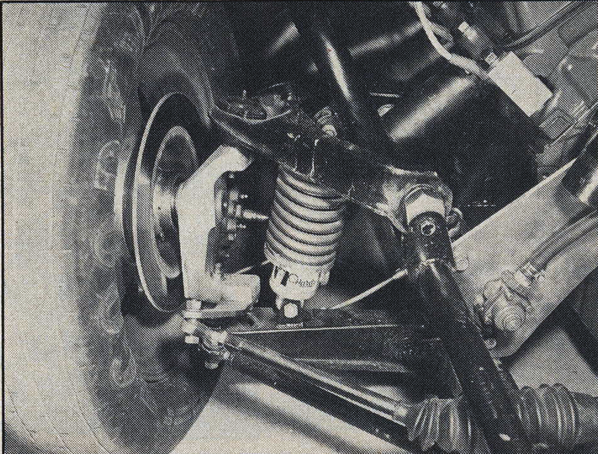 Steering is handled by a Pinto rack-and-pinion unit, which is solidly fastened to the very front of the frame, and which used in conjunction with aluminum uprights, steel spindles and steering arms cut from chrome moly stock, all of which were supplied by Strange Engineering. Wayne Gapp gets the credit for designing and dialing-in the suspension. Up front, there are specially lightened upper and lower control arms which have been designed to clear the front header pipes without necessitating severe bends in the tubes. Monroe coil-overs keep the front end up. Special aluminum uprights were supplied by Strange Engineering. Careful front end layout eliminates camber changes and toe-in. Monroe coil-overs are also utilized in the rear suspension, which does away with the stock-type leaf-spring set up. A pair of very long ladder bars extend well forward under the chassis, attaching to the aforementioned frame rails. Ballast location is critical in the suspension, both to control excessive wheelstanding and the same time, to allow maximum weight transfer. This calls for multiple ballast locations, a requirement which was filled by having a large ballast bar with two grip handles bolted to the back of the roll cage, and also having a fabricated ballast tanked flanked by a pair of 50-pound batteries at the very rear of the car. In the Gapp designed suspension, the idea is to have the car take off with minimum rise in the front , with no rear axle movement in relation to the quarter panels. On a track with good bite, this means tightening up the front shocks and shifting ballast to the forward mounting to restrict front end rising, while on a slick track, the shocks would softened up a bit with most of the weight in the back. In either case, the front tires should never clear the ground by more than a few inches for the first fifty or so feet of the track. The Mustang II currently runs a full-sized 351 cubic inch Cleveland engine, although their car is light enough so that with a minimum of reworking, this can be swapped for a 320 cubic inch motor based on the Boss 302 (see April ’74 SS&DI-“327 Ford”). They have one of these motors ready to drop in should they so choose, for instance, if a situation arises where they feel they can derive overall efficiency per cubic inch from the smaller inch motor. So far, the car has run a best of 8.84 at 154.90 at NHRA legal weight. The 351 that they now run features the stock bore and stroke of 4.005″ x 3.500″. Since the Cleveland engine has an oiling problem at high rpm, the block must be massaged to get it up to par. Gapp and Roush have designed restrictor kits which are produced by Moroso which they themselves utilize. These restrict the oil flow to the cam bearings, the lifter galleries and the valve train, and provide increased pressure to the main bearings where it is needed. This is further enhanced by the use of a 100 pound oil pressure relief valve. 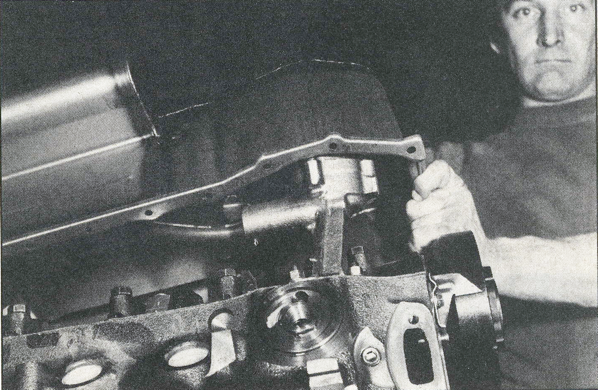 The Boss 351 crank is modified to accept Chevy-sized aluminum rods which were designed for the Ford by BRC. The stock external counterweights are eliminated in favore of welded internal weights, which reduces excessive loads on the front and rear bearings, and also helps prevent high rpm bending of the crank. The internal weighting is done with tungsten carbide, which costs $7 for a linear inch of one inch round stock. Slugs of a very heavy Mallory alloy are pressed in to the stock counter-weight so that the crank can be internally balanced. External counterweighting is eliminated. The stock 5.775″ length Cleveland rod is discarded in favor of the aforementioned Brooks unit, which measures 6.060″ end-to-end. This is use in conjunction with a specially designed BRC piston for which Gapp and Roush designed a special maximum compression popup and a broad fire-slot. The tapered wrist-pin is located just under the oil ring to make up for the additional rod length. Finally, the ring combination is a special Gapp and Roush design, utilizing a ductile moly-filled top ring, a low tension cast iron second ring and a low tension 1/8″ oil ring. Since the steering unit has been moved forward, a rear sump pan must be used for adequate clearance. Oil movement is controlled by no less than three trap doors, and the capacity is provided by two side “wings” on the pan, which are necessary to keep 20-40W Pennzoil away from the crankshaft area within the confines of the very low car (which prevents a very deep sump). A special Econoline oil filter adapter is necessary to align the filter parallel to the block (rather than sticking straight out) so that it clears the inner panel fenders. A flexible connection is used between the oil pick-up and the oil pump. 100 pound relief spring and a restrictor kit help increase flow to the mains. 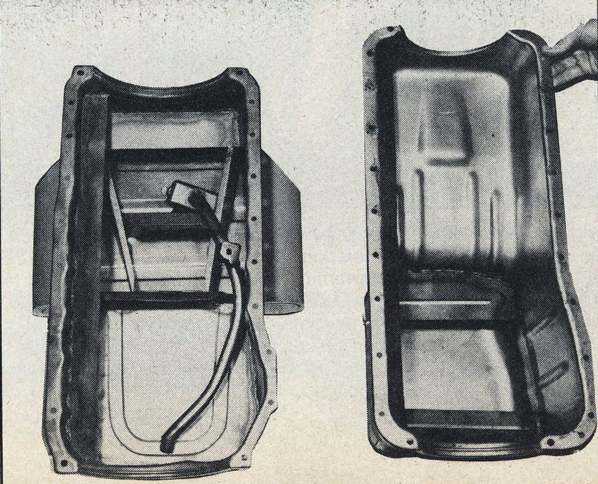 With the steering arms having been moved well forward, there is room for a rear sump oil pan featuring three trap doors (pan on left in image). Stock pan to the right. Induction is handled by a pair of 6464 Holley 4500’s which have been specially modified by Gapp and Roush for smoother flow. A close examination reveals that the inlet area to each barrel has been radiused carefully, but the other internal modifications are something that Roush is reluctant to divulge. 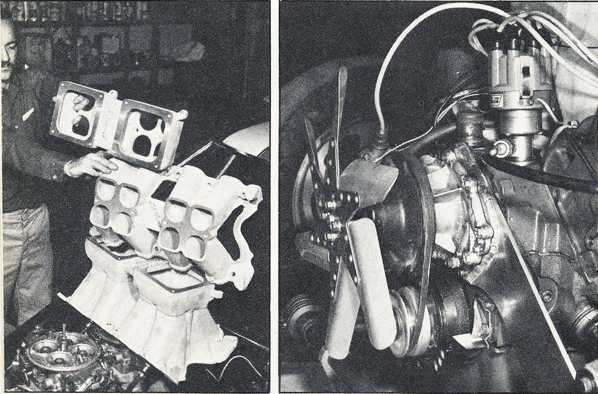 The carbs sit atop an Edelbrock manifold that has also undergone thorough massaging. For cooling purposes, the webbing between the individual runners has been cut and ground away, allowing air to circulate freely around the runners. Also, the plenum volume has been reduced by sectioning to improve response, and also for proper height in relation to the hood scoop. Needless to say, the finer details of the internal mods are not open for discussion. The Edelbrock manifold has the webbing trimmed out from between the runners before installation, as this allows freer air circulation and hence, a cooler air mixture flowing into the head. Roush sections the plenum to reduce volume as this seems to imporove enging response and assures proper seal for the carbs within the hood scoop. An aluminum water pump unti from a 289 is used, but requires a half-inch spacer welded to the engine mount for proper clearance. 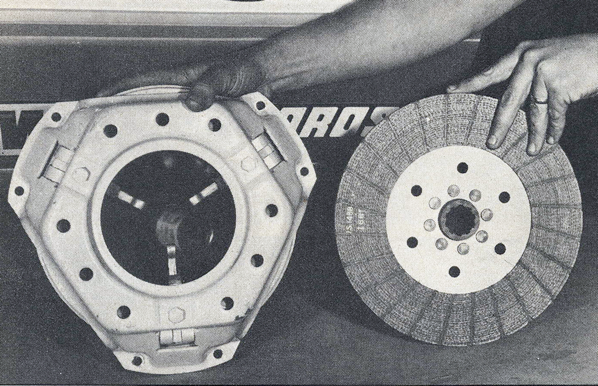 Note the use of the undersize crank pulley, which reduces fan speed, and also prevents belts from flying off at high rpm. The manifold passes the intake mixture to the now famous “high-port” Cleveland heads for which Gapp and Roush now supply the aluminum plates for raising and straightening the exhaust ports. The crossover passages in the exhaust ports are epoxied shut, and the combustion chambers are thoroughly cleaned up, not to mention the usual porting and polishing. The valves used are 5/1″ stem lightweight items from Manley, for which the valve guides must be bronze-bushed. To complement the trick heads, notches are cut in the blocks at the tops of the cylinders in the area of the valves in order to aid flow. The cut is about 1 1/2″ wide, and tapers gradually to just above the ring travel where it blends into the cylinder wall. The valve actuation is obtained from a 321/329 General Kinetics camshaft featuring 330° degree of intake duration and 340° of exhaust duration. At .050″ lift, this figures out to 284° and 294° of duration. The cam is run at 2° advance. The roller tappets are also GK, and are used in conjunction with special Gapp and Roush pushrods. 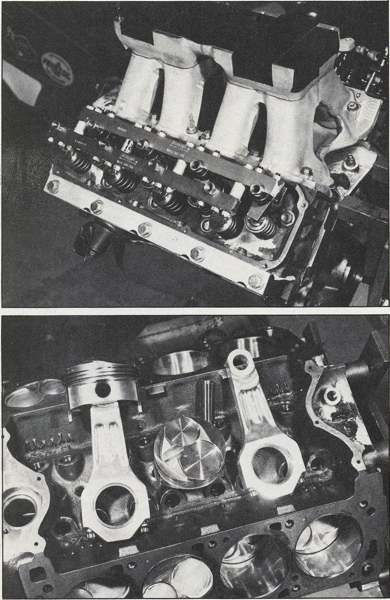 Also included in the valve train are stock Ford pushrod guide plates which have been split in half so that the GK roller rockers can be individually centered on the valve stems, and a Jomar stud girdle to which Gapp has added some of his own modifications (such as internally locking adjusters and center spacers for improved supporting action). Wayne Gapp prefers to use Accel components exclusively, utilizing the Accel BEI system in conjunction with Accel wiring and Yellowjacket spark plugs. The BEI system features a black disc which is mounted on the distributor shaft, and which regulates the emission of light from a diode onto a photo transistor. Whenever the transistor receives a light signal, it triggers the spark to the plugs. This system provides timing accuracy to within one-quarter degree, and packs more than enough energy to keep the plugs firing and very high rpm. The high energy output of the BEI allows the setting of the spark plug gaps at .035″, slightly wider than normal, and this provides slightly better combustion efficiency. Back of the Weber 40 pound flywheel is a Long-style Weber single-disc clutch unit. The bob weights at the ends of the release levers have been trimmed down, as Roush feels that even this small amount of weight can cause creeping and hence a red-light, when sitting at the line at 10,000 rpm. The spring pressure in the clutch has been intentionally limited to 2800 pounds to give a little cushioning effect during hard shifts so as to protect the driveline pieces. The entire assembly is contained inside a Lakewood scattershield. The Weber clutch is run with a solid disc, and has the bob weights at the end of the release levers trimmed off to prevent creeping while revving at the starting line. The spring pressure has been limited to 2800 pounds to allow cushioned engagements and so to protect the drive line during hard shifts. 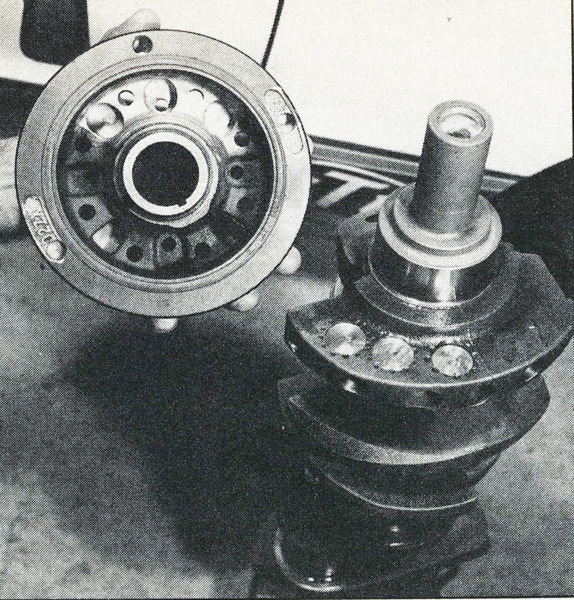 The 3.10 low gear Lenco passes the power back via a 20″ driveshaft to the specially modified Ford rear end. Inside is a set of 5.67 Schiefer Pro Gears using the 9″ ring gear, which transmits the torque through the Strange axles to the 14x32x15 Firestone tires mounted on Motor Wheel wheels. The front tires are also Firestones, and are also mounted on Motor Wheel units. The exhaust is handled by a set of Jr. Headers, which have primary tubes measuring 2 1/4″ in diameter and 28″ ling dumping into a 4″ diameter collector. The headers were specially designed to be used in conjunction with the control arms to provide a minimum of bends. Gapp and Roush give special credit to Bill Jameson, Don Hardy, Al Buckmaster, Diana Gapp, Louis Wolsinski and Ken Moe for assistance in putting together the car. Special thanks also go to Chuck Miller, who applied the beautiful blue and pearl paint job, and to Paul Hatton, who did the lettering. At present this car is one of only two Mustang II Pro Stockers in the country, the other belonging to Don Nicholson. Both cars have run very well, and should Roush’s success continue, it just may turn out to be the successor to the Pinto’s as the dominant car in the Pro Stock Class.